Bumble is a social network for discovering and fostering healthy relationships – be it personal or professional. With over 23 million subscribers to its platform, it certainly has the responsibility for ensuring that the content on their social networking application is appropriate for all. Recently, Bumble announced that it is going to ban all images of guns on its platform. Bumble has unequivocally stated that it is making an ardent effort to moderate the content on its platform to align with its values. Inappropriate sexual content and images that spur violence will be moderated on their platform. Not just newly uploaded but also previously uploaded ones. You can read the full statement here. Bumble, like many other companies, are in the need of a content pipeline; a workflow of all the operations that must happen on a piece of content before it is deemed appropriate and ready for consumption by the audience of that content. Content can be moderated and filtered by manual processing, but using human capital for content curation is expensive and not very scalable. With millions of content items to process, the manual method of filtering quickly reaches its ceiling. The only scalable and consistent way to process large quantities of “prepared” content is by integrating with a platform that supports content workflows. So how can this help Bumble? Filestack provides developers a comprehensive platform to perform complex content workflow operations with a very simple API. 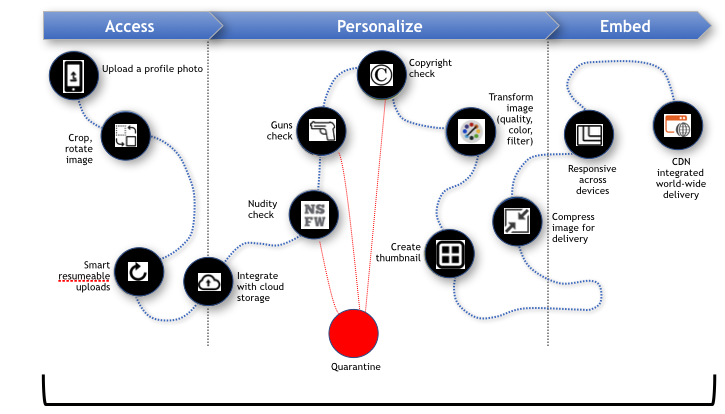 Filestack provides the platform to access end user content easily, reliably and fast – wherever it exists and then personalizes the experience of that user by curating and tailoring every piece of content through comprehensive content workflows. The personalized experience is delivered to the user across every device on any network. Filestack appreciates Bumble’s approach to fostering healthy interactions through curating content. It’s our mission to help businesses engage with end user content and personalize each experience to make it just right for them. 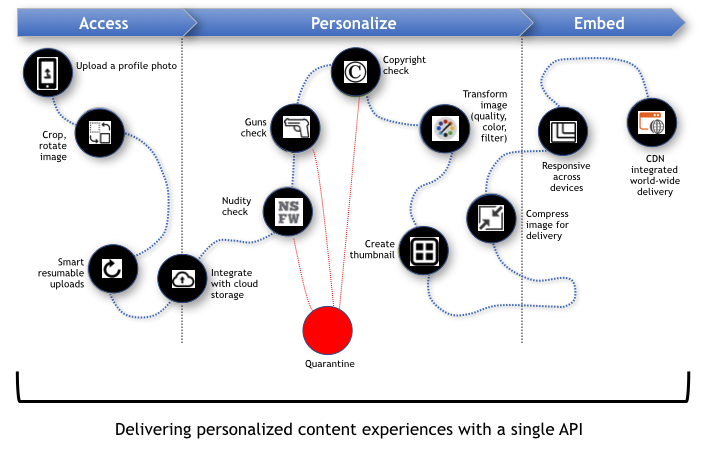 Content workflows are the key component in delivering this personalized experience through a single API call. We’d love to know how content evolves along its journey within your application. Leave a comment below or contact us at sales@filestack.com to learn more.